Home / Product Catalogue / Accented Non Tip Anti Skid Bowl with 100 % Silicon Bonded Ring. Specially Shaped Non Tip Anti Skid dishes gives elegant look to the dish. Slanted / High Back controls splashes and mess. Slanted front design for easy feeding access. Anti Skid Base Helps food not to tip of the floor. Inside High Gloss Finish is easy to clean & absorb odours. Out side Matte finish resists scratches. Isn’t your dog the most affectionate, loving soul whom you have groomed elaborately? His mannerism deserves exquisite class and style. Because he is worth it. So give him the Best. 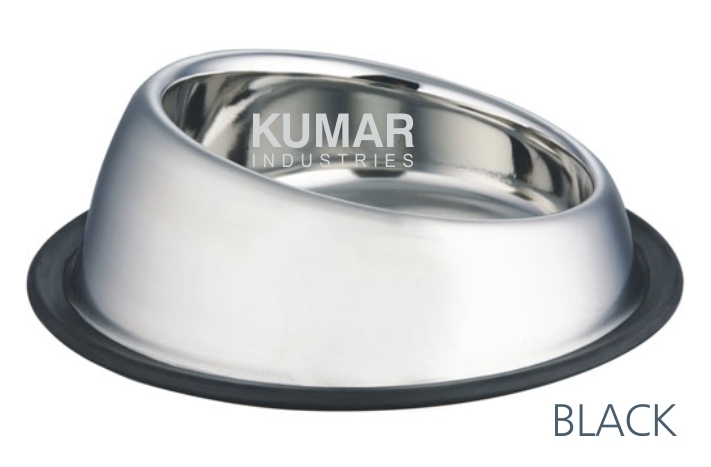 Kumar Industries presents a Designer, heavy weight, specially shaped Non Tip Anti-Skid Bowl for the elegant pets. Slanted High back for Mess Free Experience. Slanted Lower Front for great Access and easy to eat Comfort. Matte Finish on the outside to resist Scratching and Glossy Interior for quick and easy Cleaning. 100% Silicon Base for great durability. No Hassles No mess and Style Beyond words. Because Magnificence and refined grooming deserves the Supreme.